Hello! Yep, I’ve been in my little world lately..checkin in on the new ruptures but not posting…because same ole, same ole here. I can’t believe I’m at the 10 month mark….seems like long ago in some ways, but just yesterday in other ways. I so don’t miss those crutches and boot and knee walker. At 10 mths I can elliptical and bike like a mad woman…I can walk pretty intensely too…but, I need to progress to jogging some and then work my way up to running. To get back on the tennis courts…I feel like I need to be able to run pretty well. Wound Update - Saw Wound Ctr last week again. Although my wound is officially “closed” (I still won’t get in bathtub, pool or hot tub or spa pedicure at nail place) I still have this scab thing going on. It does gets smaller…and periodically I cut away the scab if it’s been on there a while…but, a new scab comes back…now, I know…we all think that the scab will one day fall off and there will be nice skin….well, hmmm…my scab has been here since wound closed on Oct. 5th…so, nice skin has had a lot of time to form…but nope. I wear normal tennis shoes to the gym, but oftentimes I still wear my backless shoes…doesn’t aggravate the scab as much. HELP PLS - So, for the longest time when I go up in a calf raise with my bad foot I have the weirdest pain in my metatarsel region…it’s like I have a pin in the middle of my foot and it springs back and forth as I go up and down…this hasn’t gotten any better. Someone told me to roll a small ball around my foot in the middle of it to work out the area. I’m wondering…will this ever go away? It borders on painful each time I go up on my toes. I know that the foot hasn’t been worked like normal for mths while I was on crutches, but I thought that by this point all would be better. :) May all of you new members to the gimpy club hang in there! This will all be behind you before you know it! Nighty Night! I am also receiving the gift that keeps giving…I guess we’ve both moved from wound partners to scab partners. 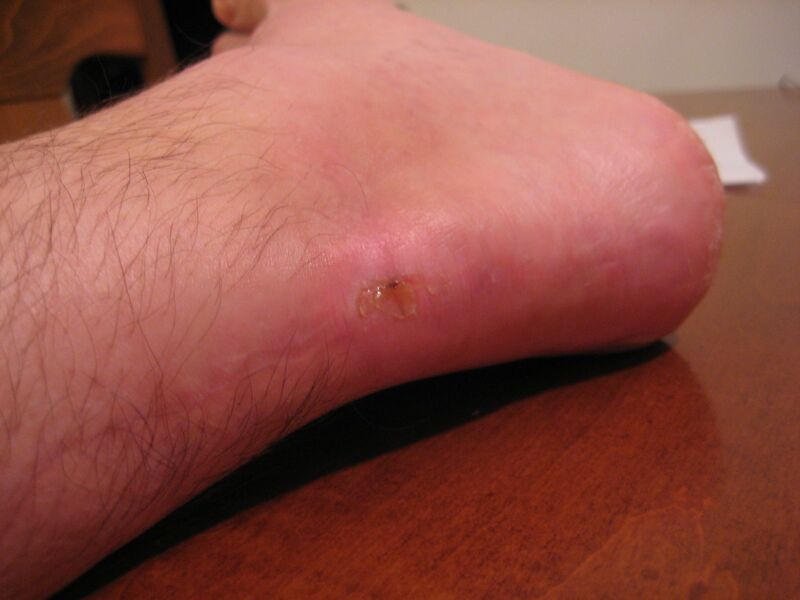 Every time a scab falls off, a new one shows up–albeit smaller and more flexible. Recently, I had a dark center that I believe is blood from the middle of where the hole was. I think it’s a good thing though, my epidermis is now full. I am going to my doctor next week and we’ll see what he has to say. Check out the scar (or lack of it). Thanks, mom and pop! Good genes, I guess. I am applying Neosporin on the scab to keep it supple. Not sure it is necessary as it doesn’t really bother me all that much (I guess it’s all relative…after a hole in the leg, a scab is no big deal). It is high enough up so it doesn’t rub on my runners. I’ll be curious as to what’s going to happen after this one falls off. I keep looking out the door but no kids…dang. I need some help vacuuming! Keep healing and congrats on running. I hope I can do that soon. It seems that I, too, have this same re-occurrence of the scabbing. Just got back from my doctor and he didn’t have anything to advise. He suggested I continue to keep applying Vaseline and/or Neosporin. He briefly mentioned some sort of minimally invasive skin auto-graft but that was quickly nixed by me. Fortunately, my scab is above my shoe and is more of a nuisance than anything else. It does get smaller each time but still there. The doctor doesn’t have any idea how long to expect this to continue. But other than that, everything looks great. He cleared me to start jogging which is good and bad. Good because I have progressed to this point and bad because I hate jogging. I am laughing about the Welcome Mat. They said they found it at school. I’ll have them stop back by and return it. They should be there any day. Pls don’t forget to give them a bath…the kids, not the welcome mat. My wound ctr said the skin is still in the friggin “reforming” stage…the “forever reforming stage” if you ask me. I did ask…when can I get in a swimming pool, etc…and still no go. Damn…looks like when we vaca in FL I’ll be in my own pool of sweat…. I put Vit E on it…and sometimes Bactroban and sometimes the Silvadene. Whichever happens to be quickest to grab. One day….I’ll take a pic soon and send you…haven’t seen the beautiful scab in a while…I know you are on the edge of your seat! Behave yourself! Site Admin | Free WordPress ThemeKristin’s One Footed (Now Two-Footed!) Blog Copyright © 2019 All Rights Reserved.